The Sony NP-FV100 is a part of Sony's InfoLITHIUM V Series of batteries, designed with the capability to exchange data with compatible equipment. 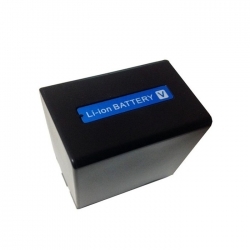 It communicates battery consumption data and remaining time in minutes, useful for long shoots. The NP-FV100 is compatible with all Handycam camcorders.